The Midrash Zuta (Koheles 7) states that “whoever purchases dalet amos in Eretz Yisrael is guaranteed a portion in the World to Come”. Not everyone is zoche to be living in Eretz Yisrael. 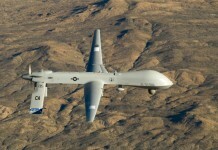 Until recently this meant some really key mitzvos were out of reach. Because the 28 Mitzvos Hatluyos B’Aretz – foremost among them Shemittah – require owning or leasing agricultural land in Israel. And that’s not easy to do from Monsey, Boro Park, Lakewood, Miami or Chicago. Now there is no longer any excuse. 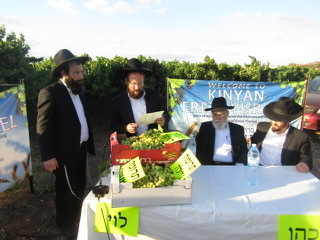 Thanks to a wonderful initiative called Kinyan Eretz Yisrael any Jew, anywhere, can own dalet amos (four cubits) of agricultural land on which either grapes or grains are grown and harvested on their behalf in meticulous accordance with all the halachos. What’s more, the owners of each parcel have the option of partaking in the actual harvesting of their very own grapes or grains. There’s no better time to start keeping these mitzvos than right now before Rosh Hashanah. Because owning land through Kinyan Eretz Yisrael is a 100% valid halachic transaction (sanctioned by leading poskim of our generation). And the schar from these mitzvos keep accruing season after season, year after year, generation after generation. The process of leasing one’s very own dalet amos of field or vineyard – and entrusting a group of dedicated rabbonim to follow through on one’s behalf – is both simple and affordable. For example, a plot of grapes costs only US$ 180 per year, while one of grain only US$ 98 per year. There’s a big discount for those that buy both or for 3 years. Then, choose between purchasing a plot of grapes, grains or both (the farms are separate.) 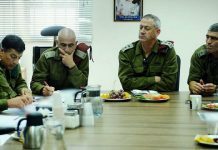 Once the transaction is finalized, they own their dalet amos of land in accordance with Halacha and the Laws of the State of Israel. Each new owner receives an offical certificate and regisration number detailing the precise location – row and line – of their plot. 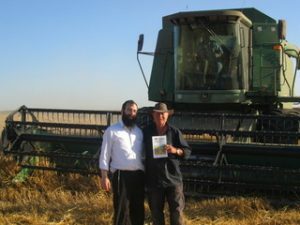 During harvest week they or their children are welcome to perform the mitzvos in the field alongside their shluchim of Kinyan Eretz Yisrael’s team. 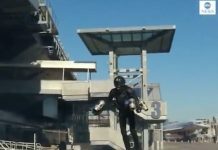 The idea is hardly new. Some 250 years ago the Vilna Gaon purchased a plot in Eretz Yisrael for this very purpose. His talmid Rav Yisrael of Shklov mentions this in his sefer Hilchos Eretz Yisrael and, much later, the Chazon Ish also encouraged Jews regarding this idea. In our times Kinyan Eretz Yisrael has the brachos and haskomos of leading Gedolim in Israel and America including HaRav Rabbi Aharon Yehuda Leib Shteinman zt”l, Rav Yosef Shalom Elyashiv zt”l, Rav Chaim Kanievsky Shlita, the Bostoner Rebbe, the Novominsker Rebbe and Rav Yisroel Belsky zt”l. 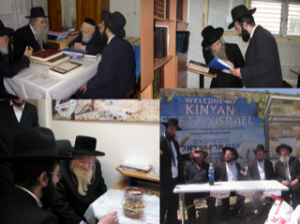 Kinyan Eretz Yisrael was the idea of a choshuve rosh kolel in Yerushalayim, Rav Meir Leibovich, who planted the seeds of the organization 14 years ago. To make it all possible, two farms were acquired one in Moshav Mazkeret Batya, where they grow grains, and one in Zichron Yaakov, for the cultivation of grapes. These farms were then subdivided into plots of dalet amos so that all of Klal Israel could have the opportunity to keep the 28 mitzvos that had been missing from their lives. The original owners of these farms – who still cultivate the fields and vineyards – had always maintained the laws of Shemittah despite all the challenges and hardships. These were the Arkin brothers in Mazkeret Batya, and David Tzairi in Zichron Yaakov. An additional field was later added in the frum Moshav Beit Uziel near Rechovot. The Arkin brothers are grandsons of Rav Zvi Arkin a fierce fighter on behalf of keeping the halachos of Shemittah. Kinyan Eretz Yisrael is not a business. It is an organization dedicated to connecting every Jew, everywhere, to Eretz Yisrael and the unique mitzvos connected to it. There can be no finer gift to oneself and ones family. There can be no better way to celebrate a bar mitzvah or chasunah than by giving the only gift that truly keeps on giving with every planting and every harvest. Right now, for anyone wishing to acquire more zchusim on Rosh Hashanah, this is the perfect opportunity, one that clearly brings us so much closer to the geulah shleimah.